Produced by Patrick Pulver, Sean Colligan and Anthony Mazza. Remember Barracuda? Probably not, but they were around for the final breaths of the hair metal movement releasing their debut Open Fire in 1989. Many things have changed since those days – hairstyles, clothing, popular radio, and even Barracuda‘s sound. I didn’t mind Open Fire, but Unacceptable Practices is much more accessible and focused. The description in the press release is right on the money with its claim of ‘heavy melodic sounds’ and ‘commercial hits’ – although this type of music doesn’t generate hits in today’s marketplace. Vocalist Patrick Pulver has a nasal Steve Perry type quality (minus the tears and excessively sentimental sap) that seems to fit the music perfectly. The songs themselves wander into Bon Jovi territory with a bit of lighter Whitesnake and Heavens Edge thrown in for good measure. 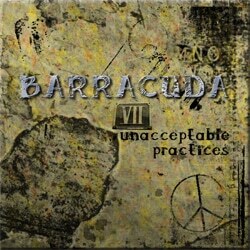 Barracuda‘s sound may have evolved over the years, but they still play melodic radio friendly rock with big harmonies. Does the world really need another tune called “Easy Come Easy Go”? Probably not, but considering it is the best track on Unacceptable Practices I can look past the title. “Keep It Warm” would have fit nicely on Whitesnake‘s 1987 breakthrough album while “Give A Little Love” dabbles with a funk groove. Also thrown in are the ballads “Forever” and an acoustic version of the band’s old staple “Superhero”. The closing track “Brothers” (featuring a guest appearance by Chip Z’Nuff) is an ode to the men and women serving their country and ends the disc on a high note. Overall the return of Barracuda makes for a satisfying release, even if it is a bit mellow as a whole. Like so many of the successful pop-metal albums this CD offers up few surprises, but delivers exactly what the listener wants and expects. Any guess who the next obscure 80s artists to return will be?